NEW YORK, August 13, 2015 – GROHE, the world’s leading single-brand manufacturer and supplier of kitchen and bath fittings, continues to spearhead innovation in the industry with an exciting new lineup for the fall 2015 season. “We are continuously working to develop innovative designs that meet the ever-changing needs of today’s customers,” said Cheryl Dixon, Head of Brand and Trade Marketing for GROHE America. “The assortment of GROHE products launching this fall has been designed to not only meet but exceed consumer expectations from style choices to water conservation efforts to total customization,” she continued. GROHE SilkMove® ceramic cartridges provide a lifetime of smooth and effortless handling. 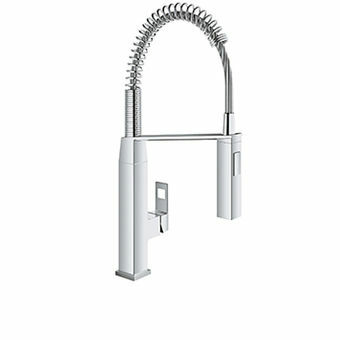 Showcased above, the new Eurocube Semi Pro kitchen faucet from GROHE in the GROHE Starlight® Chrome finish. “Eurocube Semi Pro is the result of the ongoing demand of home chefs and amateur cooks who desire professional-grade faucets in their kitchens without sacrificing sophisticated design elements,” noted Dixon. This new product combines the functionality of the popular GROHE K7 Semi Professional faucet with the company’s geometric Eurocube design. The high-style design was inspired by the modern cubism trend, and every element of the faucet is cubical, down to down to details such as the lever cutout and cubical spray face. GROHE is the only manufacturer to offer a cube-inspired semi pro faucet complete with dual spray settings, rocker-diverter, a 360-degree swivel arm and a forward-rotating lever for anti-backsplash. 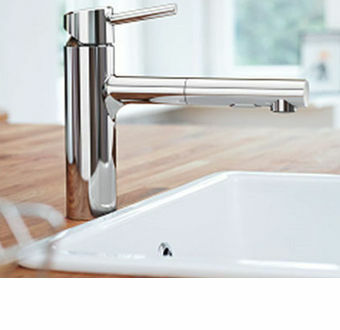 Featured above, the new Essence NEW kitchen faucet from GROHE in the GROHE Starlight® Chrome finish. Since the release of the original Essence faucet in 2006, minimalist design trends have become more prevalent while modern technology has paved the way for new innovations, leading the GROHE design team to craft Essence NEW. “The new 28mm cartridge inside Essence NEW allowed us to build a smaller body for a more delicate look,” explained Dixon. Additional new features include extended comfort height, a solid metal spray, pull-out dual spray with toggle function and an integrated temperature limiter that can be individually set to the desired maximum water temperature, reducing the risk of scalding. 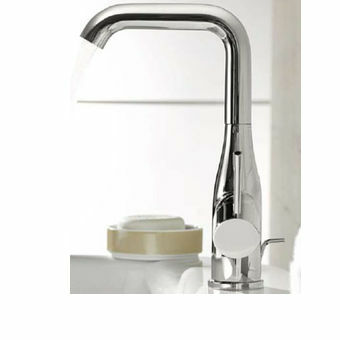 Highlighted above, the new Concetto kitchen faucet with pull-out spray from GROHE in the GROHE Starlight® Chrome finish. The GROHE Concetto faucet has been redesigned for 2015, offering individuals even more options to choose from in this stylish, best-selling line at a great price point. The new faucet brings together simple geometric forms for a vibrant, clean and contemporary design. The most notable new feature is the dual spray pull-out with toggle function, which provides more flexibility and comfort while cooking. A solid metal spray is another new distinguishing feature. The product’s adjustable flow rate limiter ensures the potential for maximum environmental efficiency. 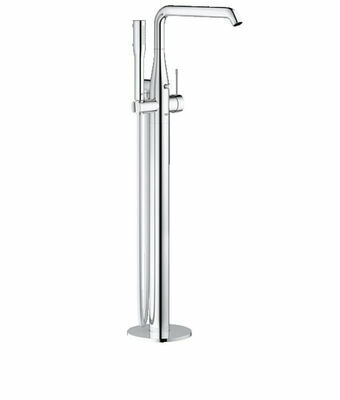 Shown above, the new Essence bathroom faucet from GROHE in the GROHE Starlight® Chrome finish. GROHE’s line of Essence faucets for bath has been newly refreshed to perfectly match with a user’s preferences, with two smaller versions as well as a medium, large and extra-large option. “The customized bathroom experience is important to today’s consumer, and with five different sizes in our new Essence bath collection, we have plenty of options to choose from,” Dixon said. The faucets have a new, clean, minimalist shape that includes a new 35mm cartridge with a temperature limiter ring, reducing the risk of scalding. 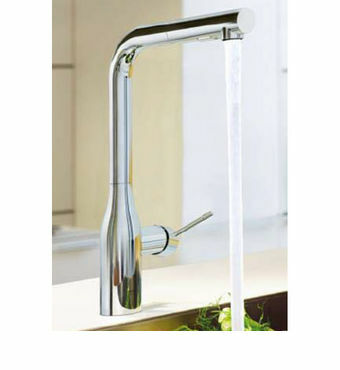 “The Essence collection features many leading GROHE innovations,” Dixon continued. These include GROHE SilkMove, GROHE AquaGuide® for an optimal angle of water deliverance, GROHE EcoJoy and GROHE QuickFix technology, which reduces installation time by 40 percent. 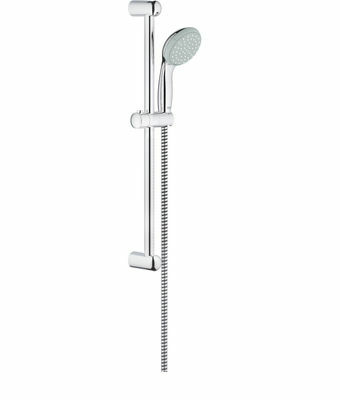 Showcased above, the new Essence free standing tub filler with hand shower from GROHE in the GROHE Starlight® Chrome finish. In addition to the upcoming line of faucets, a new free-standing Essence tub filler is available, complete with a hand shower. “As the trend towards luxurious shower-only bathrooms grows, those that do choose to install bathtubs are looking at free-standing tubs for relaxation and added style,” Dixon notes. “Individuals want to bring the spa experience into their own home, and this product is a great way to do that at an attractive price point while exuding style at the same time,” she concludes. Shown above, New Tempesta 100 Shower Set from GROHE in the GROHE Starlight® Chrome finish. “Developing eco-friendly products is an important goal we take into consideration during every step of the design process for each and every product,” Dixon noted. Launching this fall, the New Tempesta hand showers and showerheads will have a gpm of 1.5, making the line even more efficient than its WaterSense label boasts. The affordable price point makes this eco-friendly collection an even more attractive addition to any bathroom. With a crisp, cylindrical design, select shower items from this collection will have two spray settings for optimum customization. Highlighted above, GROHE’s new Aquatunes Bluetooth shower speaker. GROHE’s dedication to enhancing the shower experience through quality and innovation continues to evolve with the release of its first-ever shower speaker in the United States, Aquatunes. 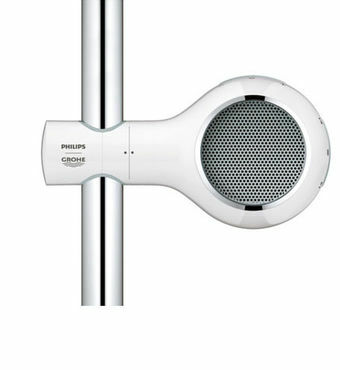 GROHE set out to create the best-sounding shower speaker on the market and partnered with Philips, a longtime leader in the audio field. “The sound quality is really fantastic,” Dixon concluded. Introduced just in time for gift-giving season, Aquatunes uses Bluetooth wireless technology to deliver users their preferred music, making their shower experience all the more enjoyable. Available on a rail set, the product comes in a crisp white color, adapting to any décor scheme.